Online marketplace Etsy appears to be branching out of the e-commerce world and making strides into the face-to-face retail space. Etsy, an online marketplace where consumers can browse and purchase creative items by artists from around the world, has been experimenting with a variety of projects this year that bring merchandise off of the website and into bricks and mortar stores and markets. Later this month, Etsy will host a cross-country event called Made in Canada, in which pop-up markets will appear across the country. The one-day event, on Sept. 27th, will take place in more than 20 cities across the country, allowing vendors the opportunity to sell their merchandise to shoppers face-to-face. In Toronto, the event will take over the atrium of the MaRs Centre, showcasing one-of-a-kind goods from 100 local sellers. The Made in Canada initiative follows #EtsyRoadTrip – a road show in which a 30-foot custom AirStream trailer brought Etsy merchandise to shoppers Montreal, Ottawa, Kingston and Toronto during the first week of August. Beyond these pop-up marketplaces, Etsy has established a longer term strategy around the concept of bringing Etsy merchandise into the real world. The initiative, called Etsy Wholesale, connects the artists and designers within its marketplace with retailers who are interested in carrying their products. The initiative provides artists with a new channel on which to sell their products, and it gives retailers access to unique new items to feature on their shelves. Earlier this year, the company announced that Indigo Books & Music Inc. has signed on as one of the participating retailers, and Indigo began selling a selection of Etsy merchandise in certain stores, including the Toronto Eaton Centre location. The steady growth of online shopping shows no signs of slowing down, and most bricks and mortar retailers have responded to that in recent years by establishing comprehensive websites and e-commerce capabilities alongside the physical stores that they operate. Against that backdrop, it’s interesting to see some retailers moving in the opposite direction by first establishing themselves online, and then shifting into the physical retail space. It’s a sign that despite the digital times in which we live, innovation in the retail industry is not a one-way street. Although the internet has opened up a variety of new sales options, marketing practices and alternative ways of connecting with consumers, there continue to be opportunities to innovate in the traditional retail world. Bricks and mortar stores, it turns out, serve an important function that cannot necessarily be fulfilled online. Consumers may be starting to shun books in favour of tablets and e-readers, but bookstore chain Indigo Books & Music Co. continues to give shoppers reasons to visit its stores. Indigo regularly holds events at its stores featuring the authors of new and popular books. The writers come in to meet fans, sign books, and in some cases, to speak to the crowd and answer questions about their latest work. These events have been happening for a few years now, but I continue to be impressed by the high profile names that the company has attracted to participate – Bill Clinton, William Shatner, Jann Arden and Randy Bachman, to name a few. 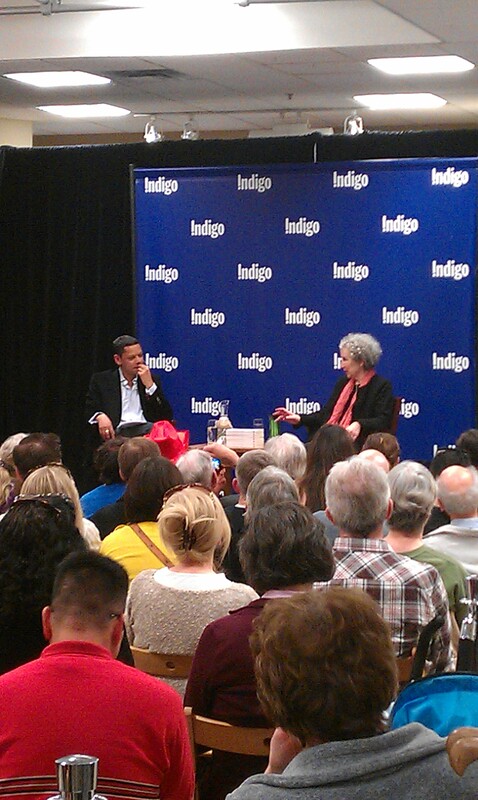 Margaret Atwood speaks with Matt Galloway about her book Payback at the Indigo store at the Manulife Centre. Most recently, Indigo hosted renowned Canadian author Margaret Atwood at its Manulife Centre store to discuss her latest book, Payback: Debt and the Shadow Side of Wealth, and the new documentary based on the book. Atwood spoke with Matt Galloway, host of the CBC radio show Metro Morning, about the key themes of the book and the process of translating these themes from paper to film. Since Atwood is one of my favourite Canadian writers, I jumped at the opportunity to see her speak and to have her sign my copy of Payback. Hearing authors discuss their work, I find, helps me to appreciate their talent even more. And this event was no exception. Atwood provided some interesting insight into the book and the inspiration behind it. The only problem with events like this one is that they tend to be a little too popular – especially since they’re free. Atwood attracted such a large audience last week that there weren’t nearly enough seats for the sizeable crowd, and there’s limited standing room in the busy store. Since my friend and I didn’t arrive early enough to beat the crowds, we were stuck standing for the duration of the event in a small, crowded space at the back of the room with dozens of other onlookers. So, if you plan to attend any of Indigo’s other events – and there are plenty – my advice is to arrive early. > The founders of the MTV reality series The Buried Life, Dave, Duncan, Jonnie and Ben, will appear at the John and Richmond Chapters store on April 10th at 7 pm to talk about their new book What Do You Want to Do Before You Die? I have a confession to make: I’m a bit of a retail rewards junkie. I join loyalty programs nearly every chance I get, so my wallet is practically overflowing with cards that earn me reward points for the purchases I make at certain retailers. In many cases, these programs lead to very few tangible rewards. Or if they do, they require you to spend a fortune along the way. But some rewards programs are certainly worthwhile, and even if they only lead to $10 in savings every few months, hey – it’s better than nothing! So, as you can imagine, I was pretty excited to learn about the new loyalty program that Chapters Indigo is launching. Plum Rewards is a free new program that earns you 10 points for every dollar you spend in store (at any Indigo, Chapters, Coles, Indigospirit, World’s Biggest Bookstore, SmithBooks and The Book Company locations). Members also get up to 5% off books that are purchased online. Once you rack up 2,500 points, you can cash them in for $5 of store credit. 4,500 points gets you $10, 8,500 points gets you $20, and so on. Depending on how often you buy books, it could take quite a while to earn store credit under this program. But on the bright side, there’s no rush to redeem your points: they won’t expire as long as you’re earning at least one point every two years. Indigo has another loyalty program, irewards, which will continue to exist alongside the Plum Rewards program. Rather than points, irewards provides members with a discount on all purchases: 40% off on bestsellers, 10% off on other books, 5% off on “other” merchandise (a category that’s growing by the day: Still a bookstore, but with fewer books) and 5% off books bought online. The catch is, irewards membership comes with an annual fee of about $35, which means it’s only worthwhile for frequent Indigo shoppers. The new Plum program – because it’s free – will enable occasional shoppers to jump on the rewards bandwagon, too. If you don’t share my appreciation for retail rewards, you’re probably cringing at the thought of another plastic card taking up space in your wallet. And I’ll admit, with so many loyalty programs around, it’s hard to keep track of them all. But until my wallet splits at the seams, I think it can handle one more. 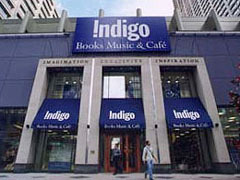 Indigo Books & Music Inc. continues to shake up its in-store offerings, and while books remain prominent, they no longer seem to be front and centre in the retailer’s stores. In the past couple years, Indigo has been beefing up its selection of stationary products, gifts and lifestyle products, games, music, DVDs and even food products. At some Chapters and Indigo stores, like the Toronto Eaton Centre location, there seems to be a lot more emphasis on this other merchandise than books. Most recently, the company has begun experimenting with new personalized gift items in stores. It has launched a new concept called IndigoStudio in two GTA locations, Erin Mills and Queensway, where customers can have items customized with their own photos, artwork and images. For example, as an alternative to framing a picture, IndigoStudio allows you to have high resolution photos printed directly onto glass. Other customizable items include greeting cards, calendars, mugs and others. I imagine the new selection of merchandise is Indigo’s way of reducing its reliance on traditional book sales, which are declining with the rise of electronic books. So far, this strategy seems to be working. In the latest quarter, Indigo said revenues jumped by 13.9% over the same period last year, partly thanks to growth in the sales of gift, toy and paper products. It’s nice to see that the retailer is still investing in its stores, and finding new ways to keep customers coming back. But if it shifts its merchandise too far beyond the realm of books and music, I have a feeling its consumers may get confused about the chain’s specialty. The customizable photo products, for instance, could make thoughtful gifts, but are a bit of an unusual offering for a bookstore. I’d be more likely to shop for this type of item at a photography store like Black’s. It will be interesting to see whether the IndigoStudio pilot project takes off. Meanwhile, on the core book side of the business, Indigo seems to be doing a pretty good job of adapting to the shift to digital reading. Last quarter, the retailer reported strong growth in its digital division. Sales in its online segment were up 6.5% over last year, largely thanks to sales of eReaders and eReader accessories. This transition to digital books, however, has its costs. Indigo’s net profit fell to $30.2 million in the third fiscal quarter, from $34.5 million last year, due to its various digital investments. I have a feeling that the shift to digital consumption will continue to present challenges to bookstores over the next few years. But this retailer, for one, seems to be adapting pretty well.